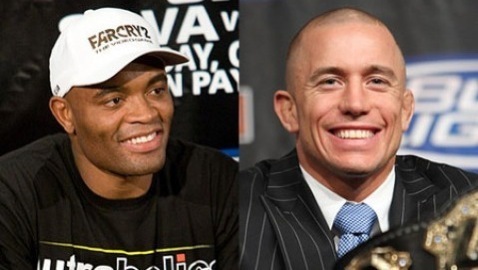 If Georges St-Pierre can defeat Carlos Condit at UFC 154 in Montreal, it appears a showdown with Anderson Silva is looming. UFC president Dana White has hinted at a possible megafight between Silva and St-Pierre for years, but because of timing, injuries and other fights that had to happen the bout has never been put together. Now with St-Pierre on the precipice of his return to action after more than a year away following knee surgery, White is ready to make the fight happen if the Canadian champion is successful in his hometown title defense in November. “I think we’re pretty close. If Georges St-Pierre beats Condit, that could be the next fight,” White said during UFC Tonight on Tuesday. Since defeating Chael Sonnen at UFC 148 in July, UFC middleweight champion Anderson Silva and his camp have seemed more than enthusiastic at the idea of facing St-Pierre next. White says the feeling is mutual from St-Pierre’s camp, and what could be the biggest fight in UFC history may finally come together in the next few months. As far as what weight the pair would face off at, the UFC president believes it will be a catchweight bout. While Silva has fought in several weight classes throughout his career, and even contemplated a move to welterweight to face St-Pierre at one point, White believes a catchweight fight would be the ticket for the fight to happen. “At one point, it sounded like Anderson wanted to go to 170 and wanted to take Georges’ welterweight title, that’s what he was talking at one point. Then it was 180 catchweight cause Georges doesn’t want to go to 85, he’s going to stay at 70, and he goes, ‘If I have to make the move to go to 85, I’d have to stay at 85.’ So we figured that a 180-pound catchweight makes sense,” White stated. The other caveat to this situation coming to fruition is where the bout would take place. If White has dreamed about a Silva vs. St-Pierre superfight, it’s fair to say he’s had just as many fantasies about putting on a card at the famed Dallas Cowboys Stadium in Arlington, Texas. Also known as Jerry Jones’ (owner of the Dallas Cowboys) ‘billion dollar playpen,’ Dallas Cowboys Stadium holds over 100,000 fans if filled to capacity, and White believes Silva vs. St-Pierre would be the perfect fight to take there. “If that fight happens, it will probably happen at the Dallas, Texas, stadium,” White commented. Of course as close as this fight appears to reality, a lot of things still have to happen before bout agreements are issued and the fighters sign. Still, in the world of the biggest fights possible, there may be none bigger for many years to come than Anderson Silva vs. Georges St-Pierre.